After what seems to be years of waiting, Google finally introduced a new long-awaited feature for its note-taking app Google Keep. This feature-rich update happened along side other Google app updates, the new version of which came with huge design changes and new functionality. Google Keep’s latest update now allows users to share their notes and collaborate on those. 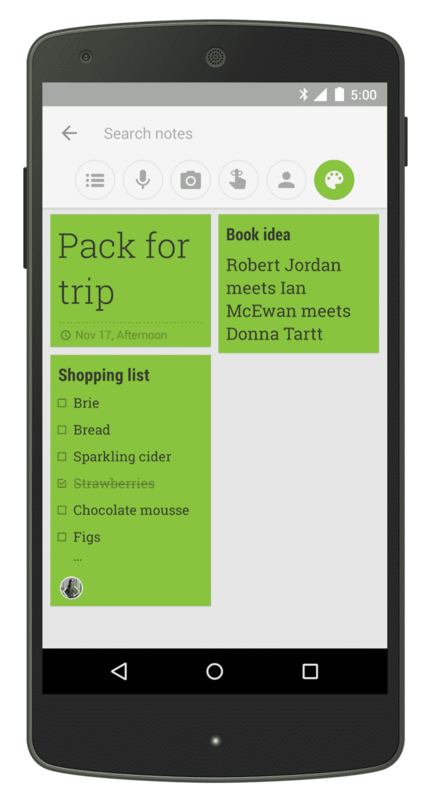 You can now, for example, share groceries lists with your family and meeting notes with your colleagues. And as with other Google Drive apps, you can collaborate within Google Keep in real-time, making sharing notes with others a much better experience. As one could imagine, sharing notes with the new and improved Google Keep is pretty straight-forward. Simply select the “Share” option below your note (on desktop) or in the top-right corner of your app and type in an email address of the person you want to share the note with… and you’re done! The person on the other side will automatically receive an email with a notification. Also, the shared note will appear automatically among other notes in Google Keep. Collaborating within notes has also never been easier. Everyone with access to any given note can edit it, and others will see the changes in real-time. The live collaboration feature also works across devices and platforms, so it doesn’t matter if you are on the go or at home using a full browser to edit the note. Even adding an image to the note will make it appear automatically for those who you’ve shared the note with. For a number of reasons Google has preferred not to add a shared reminder feature for Google Keep, where one could set a time or location for another person to me reminded of something. Also, changing the note’s color on your account will not affect the others’ note, as well as archiving. However, if you, as the owner, delete it (not to be confused with archiving it) the note will also be deleted from the list of those people who you’ve share the note with. The new Google Keeps comes not only with the new sharing and collaboration feature. The latest version of both the app and web-app allows you to search and sort your notes by color and content. This means, that, for example, you could filter for green notes with an image attachment, or yellow notes with a voice recording. Although the technology behind the last Google Keep update is nothing new whatsoever, it’s still a nice improvement to one of Google’s top apps out there. The new features, along with the beautiful and simplistic design, are definitively a good sign for Google’s move towards cross-platform functionality and improved user experience. The sharing and collaborations feature might also open up a door for third-party integrations with Google Keep, which is something many of us techies would be looking forward to see in the future.